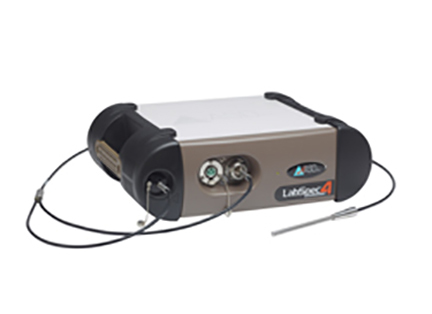 The Labspec® line of laboratory instrumentation offers research-grade instrument performance in a rugged package suitable for transport to the sample location. LabSpec analytical instrumentation performs rapid, non-destructive materials analysis for qualitative and quantitative applications. ASD has raised the bar, yet again, for lab equipment with the introduction of the LabSpec® 4 Standard-Res laboratory analyzer. Employing state-of-the-art near-infrared (NIR) spectroscopy, the portable lab analyzer can quickly and nondestructively measure a wide range of materials with absolute precision. 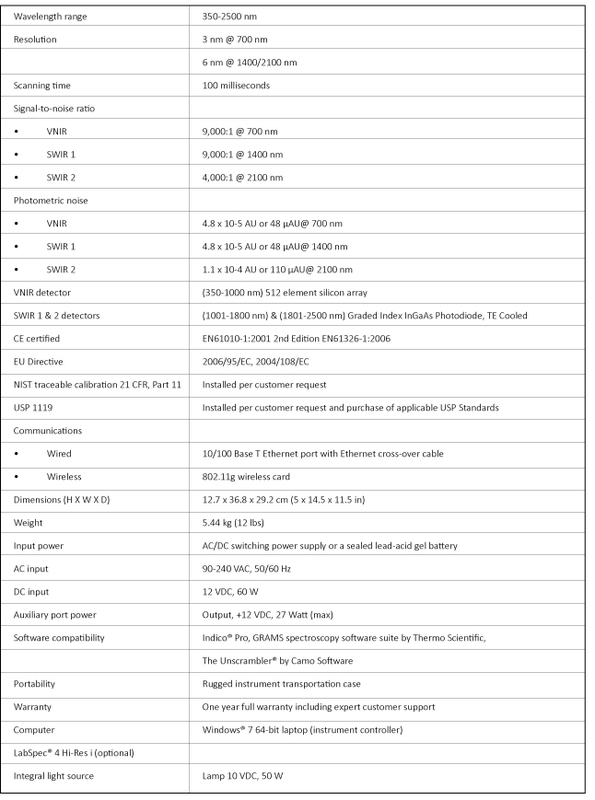 Improvements to the LabSpec 4 Standard-Res’ spectrometer configuration have more than doubled the performance in the SWIR regions for faster, more complete material measurement. Evaluates multiple properties simultaneously through NIR energy that penetrates several millimeters into organic substances. 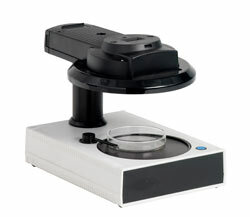 Identifies both liquids and solids in real-time with no sample prep required. 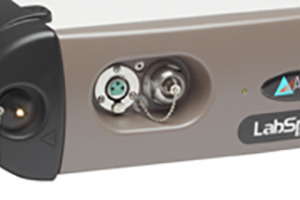 Enhanced spectrometer configuration yields faster data capture with the same spectral precision, or dramatically improved data quality in the same amount of time. Maintains all signal-to-noise characteristics at high analytic throughput rates for accurate evaluation of hundreds of samples per day. Improved portability thanks to a standard 802.11g Wi-Fi connection and a ruggedized fiber optic cable. With a 10 nm resolution, the LabSpec 4 Standard-Res lab analyzer provides an ideal balance between spectral resolution and noise performance and can be used for measuring materials such as food and feed products, forestry products, and a variety of raw materials. The LabSpec 4 Standard-Res lab analyzer is available with an internal broad-spectrum halogen light source (LabSpec 4 Standard-Res i model) for more versatile material analysis. 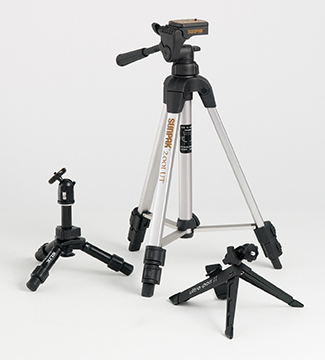 Used in a variety of applications for mounting illumination, sampling accessories, and the FieldSpec® HandHeld 2 spectroradiometer. For more information on The LabSpec 4 please visit our Knowledge Center. Optimized to provide the most precise material analysis in the shortest amount of time, the LabSpec® 4 Hi-Res lab instrument is the ideal analytical instrument for fast-moving laboratory environments. 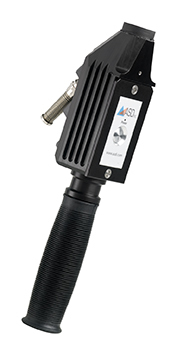 The latest addition to ASD’s LabSpec line of portable lab spectrometers uses advanced near-infrared (NIR) spectroscopy to characterize a variety of materials in real-time with no sample prep. An updated spectrometer configuration delivers remarkably accurate spectral data in a fraction of the time required by previous ASD analytical instruments. New spectrometer configuration more than doubles the performance in the SWIR region for faster spectra collection without any loss in data quality. Spectra analysis performance and signal-to-noise characteristics remain consistent at high throughput, allowing processing of hundreds of samples per day. Analyzes multiple constituents simultaneously, moving with the speed of production to evaluate incoming, in-process, or finished materials almost instantaneously. Improved portability afforded by a new ruggedized fiber optic cable and a standard 802.11g Wi-Fi connection. 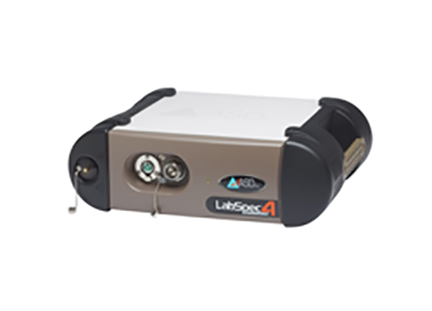 The LabSpec 4 Hi-Res produces exceptional high resolution spectral data while maintaining an outstanding signal-to-noise ratio. 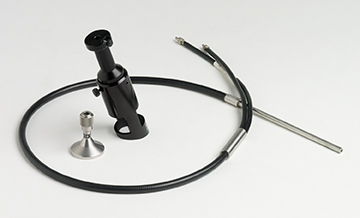 This analytical instrumentation is ideally suited for measuring materials that have sharp, well defined spectra features such as polymers, petrochemicals, industrial chemicals, and pharmaceutical active ingredients. 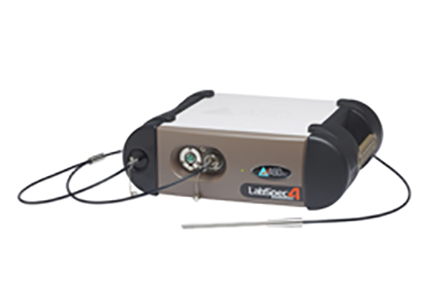 The LabSpec 4 Hi-Res analytical instrument is available with an optional internal broad-spectrum halogen light source (LabSpec 4 Hi-Res i model) for even more versatile material analysis.